My second day in England has officially ended. Following a surprisingly smooth red-eye flight from Monday night to Tuesday morning (less than half the seats were filled, so we could spread out across multiple ones), my dad and I drove to Winchester. Winchester is full of history, but very little of it has to do with King Arthur. The main attraction, as far as my senior project is concerned, is King Arthur’s [replica] Round Table. Just to be clear; it’s not the real Round Table. It was actually created in the 13th century, during the reign of Edward I (a known Arthurian enthusiast), probably for one of the ‘Arthurian Tournaments’ he hosted. During Henry VIII’s reign, the table was repainted to include the Tudor Rose and Henry sitting in Arthur’s seat. (Yes, it’s on a wall). The names of 24 Knights are painted around the edges. It was a lot of fun to try to read the calligraphy, although it was extremely difficult since many of the names were spelled differently from how I’m used to reading them so it turned into a bit of a guessing game. Some of the Knights included Mordred, Lancelot, Galahad, Gawain, Percival, and Tristan. 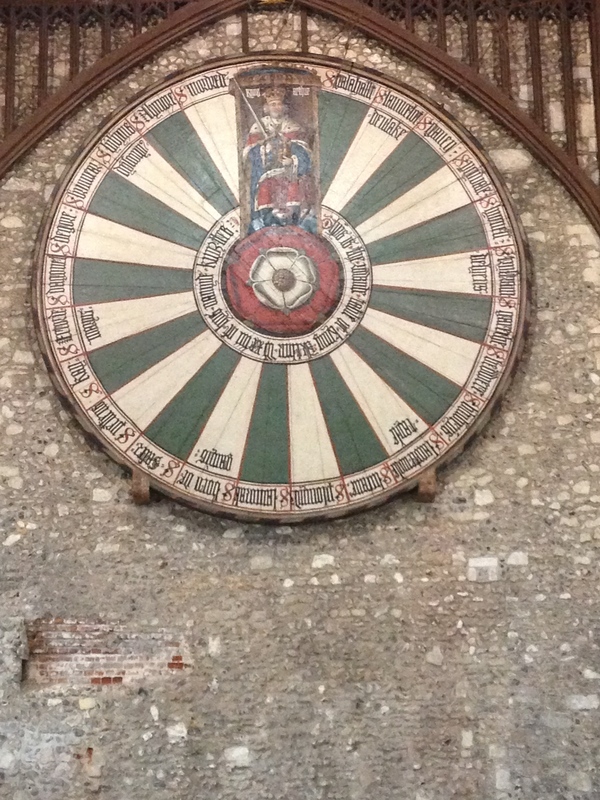 By the time we were finished visiting the Round Table, we were exhausted and had an early night in, marking the end of the first day of my senior project. Today dawned bright and early. We spent an hour walking around Winchester itself, following the walls the Romans constructed centuries ago around the city. In a lot of places some of the height of the walls was worn away, but in a few spots they were still completely intact. Then my dad and I made our way over to the Winchester Cathedral, which admittedly has no real relation to King Arthur. What the Winchester Cathedral does have, however, is a ton of history. There is so much history intertwined within those walls that our tour guide repeatedly jumped from the 12th century to the 18th to the 15th and so on. My favorite part was visiting Jane Austen’s grave (yes, she’s buried in the vicinity of bishops from the 13th century… she’s awesome, I know). In addition to my love of history, I’m a bit of an Austen fanatic, so even though a church hadn’t been established in that spot until a century after Arthur, it was wonderful to see. After touring the Cathedral, my dad and I drove to Stonehenge. 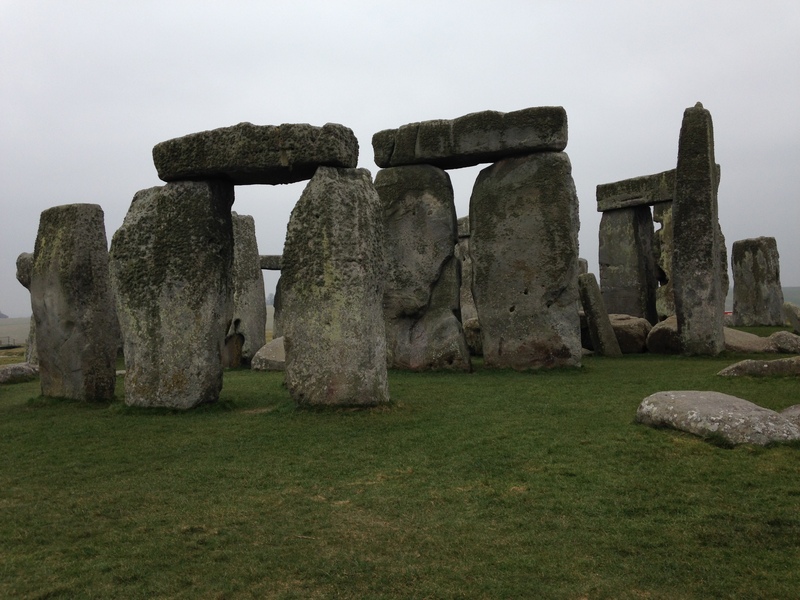 According to some legends, Merlin brought the stones over from Ireland. Geoffrey of Monmouth, the source of this legend, claimed that giants had taken the stones from Africa due to their healing properties, and that Merlin had brought them to their current resting place to act as a memorial for soldiers slain in combat against the Saxons. Of course, this version of events is definitely not accurate—Stonehenge was assembled some 5,000 years ago, not 1,500—but it’s an interesting part of Arthurian Legend nonetheless, as well as an incredible site to visit. We weren’t allowed to get too close to the stones, but we were still close enough to get some pretty amazing pictures.